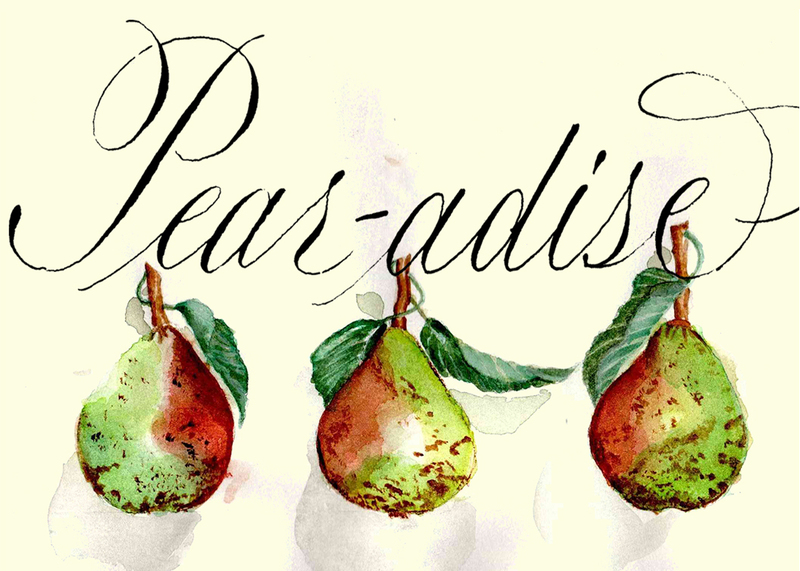 This month's ATC is devoted to Annie Lawrence, the Society for Calligraphy's retreat director, who is moving to Paradise, California. I painted the pears several years ago. They're from Billy Showell's book, Watercolor Fruit and Vegetable Portraits. I discovered the book, in Dutch, in an art supply store in Bruges. I couldn't really read the technical writing, so the text was no help. I later found the book written in English. I'm just back from our six-day retreat trip, where I incorporated the lettering with the painted pears. I gave an ATC to each of the 31 retreat attendees. In return, several others decided to make cards to share--lots of fun.